The serve is the only skill you can perform in volleyball all by yourself. Learn how to take advantage of this opportunity. The volleyball serve is the one skill you control all by yourself. 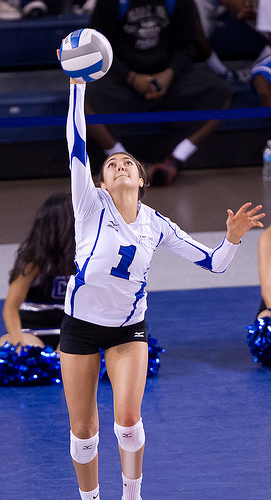 The serve is the one individual skill in volleyball that you have complete control of. From the moment you pick up the ball behind the service line, to once it leaves your hands for the toss after the ref blows the whistle, you literally have the ability to score points for your team, if you use the correct volleyball serving technique. The serve is the way the ball is launched over the net to start the rally after the ref has blown the whistle. Technically, if you can't serve the ball, you can't play the game, since throwing the ball over the net isn't allowed. This is why the serve is often the first offensive skill a player usually learns. Moose works on improving her serve during the Brunch Club clinic on Mondays. When your team is on offense they have the right to serve. Only one player can serve the ball at the beginning of a rally. The player on the offensive team, who starts in Zone 1, is the only one who can serve the ball. The server must be behind the service line until the ball has been contacted. 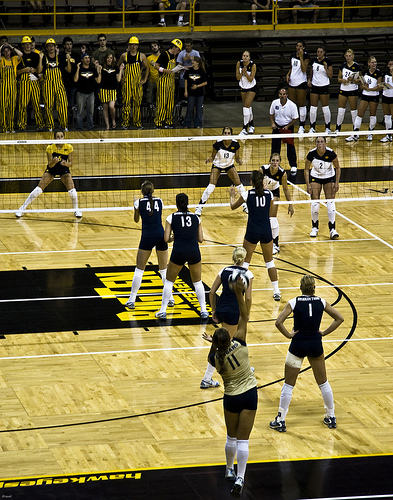 Each official match must begin with a serve from one team which is sent into the opposing team's court with the intent on starting the rally and possibly scoring a point. Before I get too technical let's review, exactly what a serve really is. What Is A Volleyball Serve? 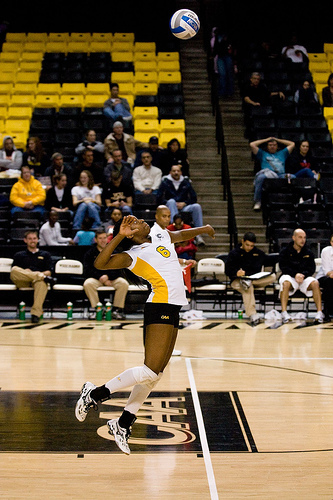 The volleyball serve is the skill used to start a rally. The serve puts the ball in play once the referee blows the whistle. The serve is your first opportunity to serve a ball. The volleyball serve is the skill used to start a rally. The serve puts the ball in play once the referee blows the whistle. Who Is A Volleyball Server? If you are the server, then at the beginning of the rally, just after the referee blows the whistle, you are the player standing behind the end line in the service zone, and within 8 seconds after the ref has blown the whistle, you serve the ball over the net. What Is The Volleyball Service? Also known as "the service" according to volleyball serve rules its the action taken by a player who is in the right back position in their team's rotation. During the course of the game this player, while standing behind the service line, tosses the ball to herself with one hand and contacts the ball with the other hand to send it across the net into the court of the team that's in serve receive.